TABASCO® brand Chipotle Pepper Sauce --- 3 Tbsp. Lime juice --- 1 Tbsp. Baking powder --- 2 Tbsp. Black pepper --- 1/4 tsp. 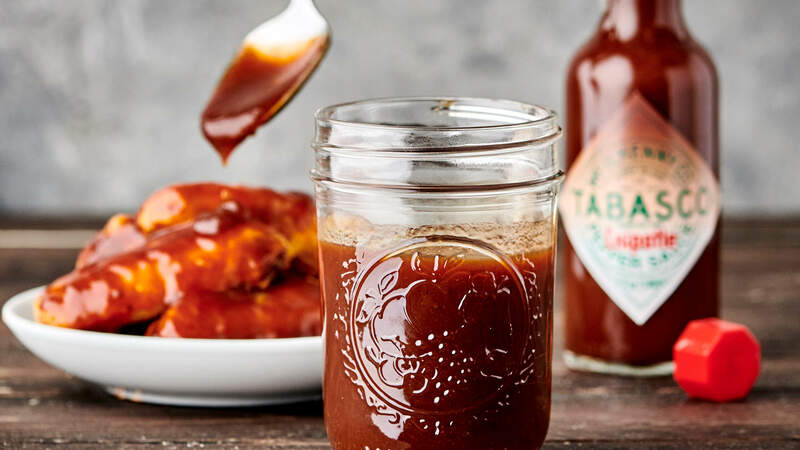 Combine all Chipotle BBQ Wing Sauce ingredients; set aside. Combine baking powder, salt, paprika and black pepper. Shake over both sides of the wings. Place seasoned wings onto a rack over a foil lined sheet pan. Place in oven. After 20 minutes, turn wings over and place back into the oven. Continue cooking for an additional 20 minutes if convection or 35 minutes if conventional oven. Cooked wings should be at least 180ºF internal temperature and crispy. Remove from oven, toss with Chipotle BBQ Wing Sauce and serve. Preheat deep fat fryer to 360ºF. Combine cornstarch, salt, paprika and black pepper. Shake over both sides of the wings. Place seasoned wings into deep fat fryer. Cook for 10-15 minutes, or until wings have an internal temperature of 180ºF. Remove from fryer, toss with Chipotle BBQ Wing Sauce and serve.